Episode 137, The Lone Fir Cemetery in Portland, OR. Brett and Harley are checking out this WEIRD city and all of the oddities we can find. Portland is modern and friendly, but it is also ODD and that is why we like it. Whether you are on a full-blown investi-cation or you are just para-curious, Portland has tons to keep you busy. If you are not into the strange, you can camp, hike, fish, ski, hit the beach or just go nutty trying every craft beer around. Lone Fir Cemetery was created in 1854, and with over 25,000 permanent residents, there is quite a lot of history and built up ectoplasm. National Geographic listed it as one of the top cemeteries to visit in the whole world. From scary history to scary ghost stories, you may want to go in the day just to be safe. If you aren’t into ghosts, maybe magic is up your alley. Mystic District is one city block in Portland with three magical shops to keep you busy. From crystals to candles and tarot to tea leaves, this place sounds like a great place to fill up your cauldrons or to even buy a cauldron if you are just starting. Diagon Alley is just an alley, this place is a whole city block! When you are ready to refuel, you should check out the oldest restaurant in Portland. Huber’s was established in 1879. Their Spanish coffee presentation is world renowned, they have ridiculously good food and the ambiance is unique. Don’t listen to Benji S., part time yelper. On ep 136 of The Travel Oddities Podcast, look out Louisville! The boys are back in town and this time they’re hot on the trail of the Louisville Demon Leaper. This time around Brett promises to keep his halves to minimum. Yes, Bourbon is a spirit that comes in a glass, but it’s also a spirit that defines their culture and compassion, their arts and parks, their creative energy. It’s this same spirit that continued and created Louisville itself – a city that combines heritage with innovation, authenticity with originality, quirkiness with friendliness in a way that’s completely unique. While this isn’t their first trip to Louisville and definitely not their first cryptid, this may in fact be a Travel Oddities first, though..a Gargoyle. That’s right, The Louisville Demon Leaper has been terrorizing residents and onlookers at the Walnut Baptist Church for years. A creature believed to be a cross between a Moth Man and some even say Batman? If gargoyles and Batmen aren’t in the itinerary then you definitely need to check out Bardstown Road. It’s the Vegas strip of the South without deviant behavior and showgirls. Although there may in fact be show girls. There is soooo much to do on Bardstown that they could hardly fit it in. Some deep cuts and choice cuts were made but you’re bound to find something to do and eat. Speaking of eating on Bardstown. This week they hit another national treasure, Jack Fry’s. This gem dates back to the ‘30s and is a must when you are in the area. Have your heard of the Haunted Sensabaugh Tunnel in Kingsort, TN? 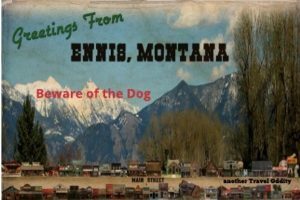 On episode 135 of the Travel Oddities Podcast, Brett and Harley face their fear of the dark and head into this creepy urban legend. 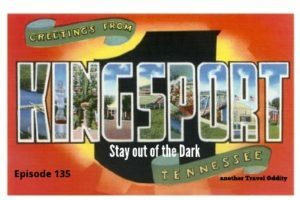 Kingsport Tennessee is a small city nestled in the foothills of the Appalachian Mountains. It is within a day’s drive of most of the US. Lauded by golfers and walkers alike, you are not likely to find a more peaceful land of parks and historical sights. If your tastes lean further towards to spooky end of the street, you are going to love the haunted Sensabaugh Tunnel. Legends of murder, ghosts, satanic rituals and automobile high jinks abound around this very creepy tunnel. If you hear the crying baby, it may just be too late for you. If you chicken out on the haunted tunnel, The Kingsport Carousel may be more your speed. This is a totally renovated 1956 Allen Herschell Carousel and it is treasured by the locals. When it is time for a quick meal, Pal’s Sudden Service is the place to be. Pal’s Sudden Service a local chain that serves incredible food, has lightning-fast drive thrus, and personalized service. It is more than a meal, it is an experience. Do you know about the curse of the petrified forest in Petrified Forest Arizona? 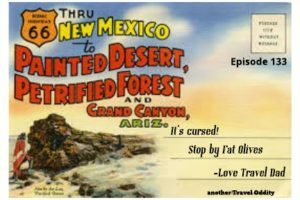 On episode 133 of the Travel Oddities Podcast, Harley and Brett brave the desert for a return to one of the building blocks of the Travel Oddities concept. Harley uses his feels to help you understand the glorious nature of this beautiful place. If you are into hiking and adventures, this national park will keep you busy. There are newly opened areas and all sorts of new ways to experience the beauty of the painted desert. If you are into spooky curses, this park has you covered as well. The curse of the Petrified Forest has been reported regularly for almost a hundred years, but don’t worry, its easy to avoid…just don’t take anything from the forest. What is the source of the curse? Is Brett an unknowing victim of the curse? If you don’t want anything to do with all of this curse business, but you do want a souvenir, then we have a suggestion for you: check out the Painted Desert Indian Center in Holbrook, AZ. From giant dinosaur statues to tiny Kachina dolls, this place has everything the road weary traveler needs to prove that they made the trip. If you just need some grub, then you are going to have to check out Fat Olives in Flagstaff, AZ. Ingredients imported from Italy, this place makes an authentic Naples style pizza that will make you want to kick little cesar in the jimmy. Brett and Harley are also slated for their very first speaking engagement at the Haunted Bourbon event in November….stay tuned. 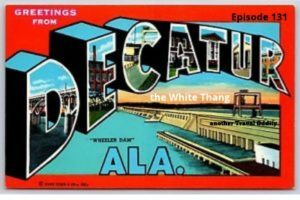 On this week’s episode, Harley and Brett are headed back to Sweet Home Alabama to hunt down the White Thang in Decatur, AL. Decatur is located on the Tennessee River in Morgan County, Alabama. It has a rich history and activities for any traveler. So, what is the Alabama White Thang, aside from being a misspelled cryptid? Let’s just say that it is a big, white and scary bigfoot, dog, lion thang. Do you like your cryptids to scream in your face? If you don’t like being yelled at by mythical creatures, may we suggest checking out some of the best bbq while listening to live entertainment at the Riverfest BBQ and Music Fest? This event is held on the third weekend in September every year. We stop in at The Railyard. This is a Farm To Fork Restaurant in Historic Downtown Decatur. 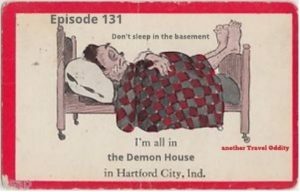 On this week’s episode, Brett and Harley are monkeying around in Hartford City, IN to check out the Demon House known locally as The Monroe House. Harftford City, Indiana was an 1800’s boom town that outlasted their neighbors by the strength of the sticky note. If you like hiking trails, you are going to love this little city. The Monroe House is a realtor’s nightmare and will probably guest star in your nightmares as well. This demon infested house has been running off residents and even hardened paranormal investigators for years. Does the Orkin Man spray for demons? Would you spend a night in the demon house? What is the scariest thing to hear on an EVP? If you don’t want to solve the mystery of the Monroe House, maybe you should check out the Ft Wayne Children’s Zoo. This Zoo is less than an hour away from Hartford City in Ft Wayne, IN, and has some truly unique and fun activities especially for the kids. We stop in at Ivanhoe’s Ice Cream and Sandwich Shoppe for one of their one hundred flavors of ice cream and Harley screams at another bad review. Find out how to become a member of the 100 Club. Hint: You do not have to send money to Pat Robertson. On this week’s episode, Brett and Harley are feeling the heat in Tonopah, NV to check out the Clown Motel. Tonapah is halfway between Reno and Vegas…so basically in the middle of the desert. Not only is the the perfect place to see the night sky, but it is also perfect for rock hunting, hiking, bird watching, wildlife viewing, mountain biking, off-roading & hunting. The Clown Motel on the other hand is perfect only to fill your nights with horrific nightmares and flashbacks to Stephen King’s IT or the movie Poltergeist. Is the Clown Motel haunted? What is the Tonopah Plague? What percentage of the world has Culdrophobia? If want don’t like clowns, zombies or ghosts, how about geocaching? Tonopah is a geocaching mecca and we have the scoop. We also check out the Tonopah Brewing Company where their motto is “Blood,Sweat and Beers” and there specialty Craft Brews and BBQ. 128 – The House of Mary Surratt – Washington, D.C.
On episode 128, Brett is limping his way to Washington, DC, while Harley fails at laughing and/or offending anyone. Why are we headed to DC? The House of Mary Surratt is a conspiracy haunting….it’s a two-fer. We went light on the DC tourism details…because it is a bottomless pit of interesting and entertaining places and things to do and ain’t nobody got time to cover them all. The House of Mary Surratt is a location of significance in the Lincoln assassination and it may just be haunted by the ghost of a wrongfully accused co-conspirator. From ghostly footsteps to phantom apparitions, this place has had thousands of people report paranormal activity. How was she involved in the assassination of our sixteenth president? Do politicians really eat babies? If want like the night life, but not the afterlife, may we suggest The All Night Art Show? Did you know Washington DC is known for chili? Ben’s Chili Bowl is home of the Legendary “Half Smoke” and Brett will hop on one leg to get some.